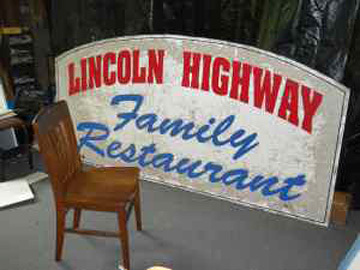 A constant stream of Lincoln Highway memorabilia shows up on eBay, less so on craigslist. But here’s a sign from the Lincoln Highway Garage that was on Rt. 462 in York that advertised the LH Restaurant inside. The station is long gone, replaced by a Turkey Hill store that pays homoage to the old place, but this souvenir has survived. If you have any information, please contact Mindy, who is also Executive Director Preservation Pennsylvania, at mcrawford@preservationpa.org or (717) 880-6275. Also keep watch at regional antique shops and on eBay. The posts, which have a directional arrow on the side, weere planted in 1928 to mark and commemorate the Lincoln Highway. Nov 6 = I gave a few more interviews and met a few former Penguins who are now announcing games. And I met the current best player in the world – Sidney Crosby…. 10 minutes into the first period they had a very nice ceremony with a video tribute to me on the jumbotron where I was presented with a couple of gifts. I received a proclamation from the mayor of Pittsburgh that November 6th, 2008, was Official Phil Rosenstein Day for the city…. After that, we went up to the owner’s box where I got to meet the owner himself – Mario Lemieux. What more can I say?? Nov 7 = I stopped in Greensburg for a free milkshake around noon because they recognized me from the TV…. I never would have made it to Greensburg without Dan’s help by taking the stroller [cart] from me. The shoulder came and went often and all the traffic would have been within inches of hitting me had I been out there with that stroller…. I made it to the edge of Laughlintown before stopping for the night. Nov 8 = The temperature today was 49 degrees to start and then never got any higher. Part of that is due to the amount of time I spent climbing a few mountains today. Though they were only 2900 feet high, it still isn’t easy pushing that stroller up them…. I took a picture of one of the more beautiful Lincoln Highway (Route 30) murals. I ran about 40 miles again today and ended up getting into Schellsburg just as it got dark. Nov 9 = I left Schellsburg feeling a bit sore from all the recent miles and the hills, but I still made good time getting into Bedford where I met up with Alisa and here friends Sue and Peter. I spent all day running without the stroller, but with two people while the third waited five miles ahead for us. It was weird to run with other people, but I really enjoyed the company and made good time running a steady pace all day. We finished the day about 13 miles east of Breezewood. By running without the stroller and the hydration vest, I was able to finish the day with more than 40 miles once again – third day in a row. Nov 10 = I ran 40 miles once again today. That’s 4 days in a row now. My legs can feel it now. I was pretty sore all day long and really struggled in the afternoon. In the morning, I went over a few more mountains where it was snowing on top. It’s much easier without the stroller (left behind at Alisa’s place) going up a mountain. Going down is where it hurt the most. After that it was flat, but the winds made it seem colder than the 35 degrees the thermometers kept saying. I finished the day in Caledonia tired, sore, and freezing cold. Nov 11 = Alisa dropped me off where she picked me up last night, but this time I had the stroller. I moved slowly since I was sore and tired from all the recent miles. I made it through Gettysburg (on this Veteran’s Day) and then another 10 miles before meeting my friends Dave and Gary who drove up from Virginia. We … made it to the edge of York before going out to dinner.